United Yacht Sales New Jersey would love to guide you through a personal showing of this 153' Heesen 2017 2017. This yacht for sale is located in South of France France and priced at $29,900,000. For a showing please contact us by filling out the form on this page and we will get back to you shortly! Book Ends - the 13th sister ship in the newly restyled 47-meter class designed by Frank Laupman at Omega Architects - is a striking, individual yacht. Her well-engineered displacement steel hull with bulbous bow provides smooth and safe cruising in all sea conditions, while her classic-contemporary 499GT design delivers finesse and sophistication inside and out.With a top speed of 15 knots, and a transatlantic range of 4,000 nautical miles at 12 knots, she has proven to be ideal for cruising in the Mediterranean, as well as basking in select areas of the Bahamas; something of pre-requisite for her current owner. 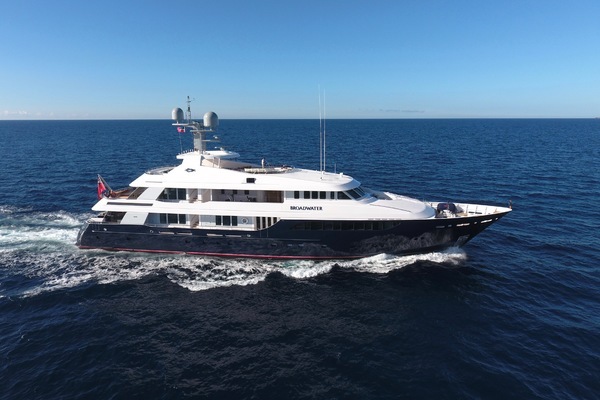 Seeking a yacht with greater stability and range than their previous vessel, the owners appreciate the consistency of Heesen's proven 47-meter platform.Book Ends combines Heesen's Dutch quality with volume, state-of-the-art engineering and advanced naval architecture. Pairing precision with performance, she is powered by two MTU diesel engines 8V 4000 M63, and is a reliable, true blue-water yacht, an evolutionary Heesen classic.The 47-meter series is known for its outdoor spaces, devoting almost 185 square meters to exterior decks. Book Ends' cozy bow seating area is the perfect place for sunsets, socializing and Mediterranean vistas, but the piece de resistance is the sprawling sun deck. Taking up 83 square meters, it features a spa pool forward surrounded by sun pads, loose lounging chairs, a bar to port and a large seating area aft. Versatile in nature, the sun deck has proven to be the ideal spot to host parties, friends and family. Book Ends boasts a highly optimized interior layout that intelligently uses every element of space on board. A key feature is the expanse of glazing that lightens and opens up the space. The airy interior is complimented by dashes and accents of a bold and warm orange - found throughout the yacht, from Hermes throw blankets, pillow and leather details to crew uniform, shade umbrellas and canvas cushions outdoors.The customized interior provides simple elegance, with plan, light wood paneling, white rugs and paired down use of furniture in order to optimize space. Artistic details have been carefully placed throughout.The sophisticated Sky Lounge provides complete serenity - a peaceful, inner sanctuary. Rounded lifted ceilings and a large round rug and coffee table echo the unusual circular walls of this floating haven. Soothing and Zen, and providing a certain tranquility, the Sky Lounge is equally as versatile in design the inclusion of games table with mid-century-inspired leather chairs means the room easily transitions from peaceful to playtime. Its calming aesthetic provides a harmonious place for relaxing.The main deck Owner's stateroom is airy and bright, with light grey paneling, a white leather headboard and large windows. Detailed raised ceilings add a sense of space and height, making the area seem larger, while the large master bathroom includes a standalone marble bath in the center with a pair of hand basins to port and separate shower and head cubicles. 10 guests in 5 staterooms. 9/10 crew in 5 cabins. FullbeamOwner's stateroom, two double guest cabins and two twinguest cabins.